Berto Salotti offers a collection of sofas and bed sofas in the foreground for technology and quality of the materials and for the high number of models, different in type, style and measures. 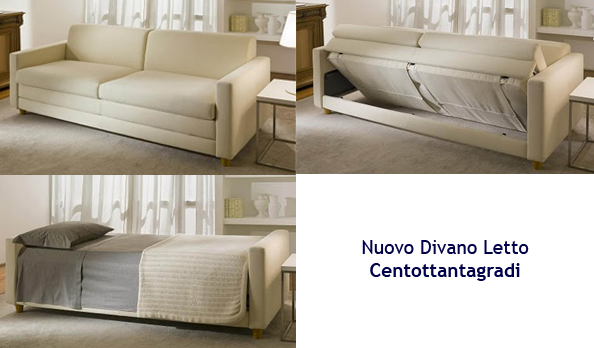 In these days we have presented Centottantagradi, a brand new sofa bed with a contemporary design, that satisfies the exigency of a single bed of high quality, excellent also for daily use. Thanks to the rotation opening Centottantagradi is the ideal bed for those who want to combine the utility of a real single bed, available and ready for any occasion, with a modern and comfortable sofa also thanks to the filling of seat and back cushions in non-deformable polyurethane foam at differentiated shares. Centottantagradi has got the dimensions of a comfortable 3 seater sofa , with a small depth, adapt also for a collocation even in service environments, such as studios or guest rooms. The sofa contains a single bed that comes out by turning the back 180°. It has an electrowelded base that comes with a two year guarantee and contains a spring mattress or a mattress with a removable cover in polyurethane foam with the dimensions of cm 185x72x h12. The wide range of covering in cloth or leather, selected in favor of quality, with attention to the variations of color and style, allows to personalize Centottantagradi and to match it with one’s furnishing. The sofa bed Centottantagradi is at the moment available at the showroom Berto Salotti di Meda (Monza e Brianza) or for online purchase.